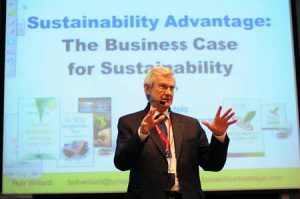 When the student-run Desautels Business Conference on Sustainability was launched in 2003, the very notion of persuading companies to embrace environmental and social goals may have struck many hard-nosed executives as an ivory-tower fantasy. But a confluence of factors is rapidly changing that view: mounting evidence of climate change, growing concern over food safety, and looming battles over shrinking supplies of fresh water, to name a few. When the student-run Desautels Business Conference on Sustainability was launched in 2003, the very notion of persuading companies to embrace environmental and social goals may have struck many hard-nosed executives as an ivory-tower fantasy. But a confluence of factors is rapidly changing that view: mounting evidence of climate change, growing concern over food safety, and looming battles over shrinking supplies of fresh water, to name a few. For a growing number of companies, sustainability is no longer seen as a slogan for starry-eyed idealists, but a necessary strategy for long-term competitiveness and brand value. Featured speakers this year included Craig Kielburger, founder of the youth-driven charity organization Free the Children, and Bob Willard, a McGill graduate who has become a leading expert on quantifying and selling the business value of corporate sustainability strategies. The conference, held Jan. 19-21 in the Bronfman Building, drew around 90 student participants, including about 20 from other universities across Canada and four from the U.S. While most delegates are in business programs, students from fields such as engineering, science, the arts and environment studies also attend the annual event.